Synopsis: On an expedition to the mountains of Tibet botanist Dr. Wilfred Glendon (Henry Hull) is on the trail of a mysterious flower that blooms only in moonlight. Entering an impossibly remote region (which looks suspiciously like California's Vasquez Rocks*), he secures a specimen of the "moon flower" but is attacked by a strange creature -- seemingly part man and part wolf. Back at the laboratory in his London estate, he tries to get the moon flower to blossom under an artificial moonlight projector he has constructed, to no avail. 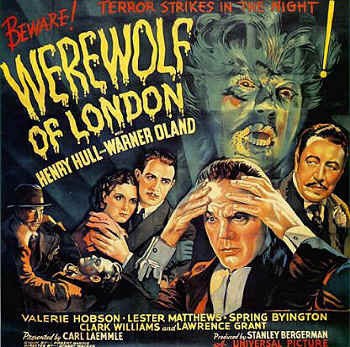 Comments: Werewolf of London was released more than 75 years ago, but even to the modern viewer it's obvious that Wilfred Glendon is a man out of his time. An inhabitant of 20th-century London, he nevertheless lives a distinctly 19th-century lifestyle, sporting starched Edwardian collars and frock coats and a pince-nez to go along with his no-fun-allowed attitude. By comparison Paul Ames, the Americanized Brit, seems like a barrel of laughs in his tweed suit and pencil-thin mustache. The screenplay is actually doing a difficult balancing act throughout. We must follow Glendon and sympathize with him as the doomed protagonist that he is; but we must also be conscious of how his single-minded obsession is pushing Lisa into the arms of another man. 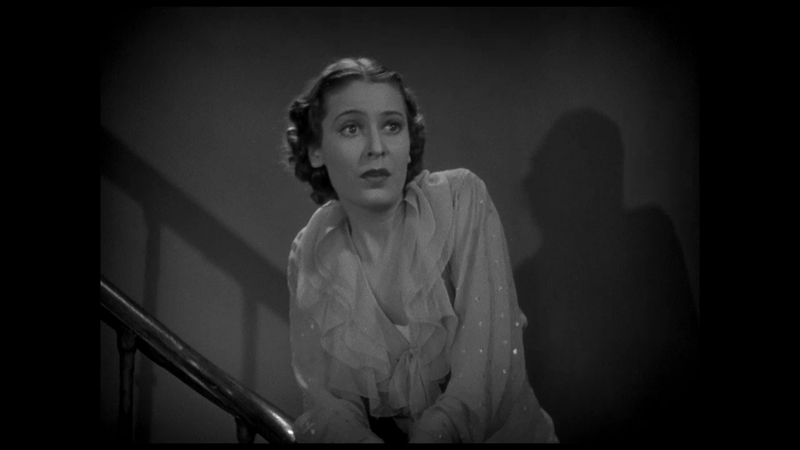 Early in the film we hear Wilfred teased for leaving his beautiful wife alone for months on end while he searches for exotic plants. Already we are being prepared to feel sorry for his loss and at the same time hold Lisa blameless for her decision to leave him for Paul. In fact Paul and Lisa are so on the up-and-up that they are always careful to inform Wilfred of whatever plans they have together, and invite him along. He is always the one who refuses their offers to join them in country walks and moonlight rides -- surprisingly romantic outings for a pair who wish to demonstrate their innocent intentions-- and while we easily understand that a closeted werewolf wants to avoid moonlight, perhaps Wilfred also knows that he would be a fifth wheel, and sooner or later he must let Lisa go her own way. Thanks....thanks for the bullet. It was the only way. In a few moments now I shall know why all this had to be. Lisa....goodbye. Goodbye, Lisa. I'm sorry I couldn't have made you happier. I prefer less chatty werewolves, myself, but at least Dr. Glendon had the good sense to cut it off there. No telling how long he could have continued blabbing on in this manner before one of the policemen in attendance thanked him with another bullet. Synopsis: In a Tyrolean fiefdom, a baron anxiously awaits the birth of an heir. But he is greatly distressed to learn that his wife has given birth to twins. An old family prophecy holds that one day twins will be born to the family, and that the younger twin will murder the older in the onyx-lined "black room" of the castle. Fearful of the prophecy, the baron orders that the entrance to the room be bricked up. Some forty years later, we find the older twin Gregor ruling as baron. He is a cruel and dissolute tyrant, hated by his subjects, and he is suspected in the disappearances of several young women. But the local authorities turn a blind eye to his activities. 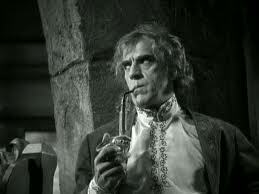 The younger twin Anton (Boris Karloff) is a nice but somewhat ineffectual fellow, and has been away since his brother's rule began. At Gregor's invitation, Anton returns home. At first Anton refuses to believe the rumors about Gregor, but it soon becomes clear to him that his older brother is every bit as cruel and despotic as the locals allege. When Gregor is implicated in the disappearance of Mashka, a gypsy serving girl, the townspeople rise up. They storm the castle and demand Gregor be handed over to them. To everyone's surprise, Gregor tells the townspeople that he will relinquish his authority immediately and turn it over to his younger brother Anton. This mollifies the crowd and Anton becomes the new baron. While acquainting Anton with his new duties, Gregor shows him an interesting trick: inside the huge fireplace in the main hall there is a secret passage that leads into the Black Room. Gregor reveals that he has been there many times, and that there is a pit beneath the room. When Anton looks down into the pit, he sees a number of bodies that have been thrown down there -- including the body of the missing girl Mashka. Gregor strikes Anton and tosses him down into the pit as well. As Anton dies, Gregor taunts him. He reminds him that, according to the prophecy, Anton was supposed to kill Gregor in that room. "The prophesy will be fulfilled!" Anton insists. "From the grave?" Gregor asks sarcastically. "Yes," Anton says as he dies. "From the grave!" Comments: We saw The Black Room just over a month ago (January 16th, to be precise) but I won’t complain about it popping up on the schedule again. It’s a delightful film, one that proceeds at a much livelier pace than Werewolf of London (which gets out of the gate quickly with an opening sequence in Tibet, but bogs down in an endless garden-party scene at the Glendon house). It's interesting that these two horror films, released in the same year, both seem to be making a bid for A-picture respectability. 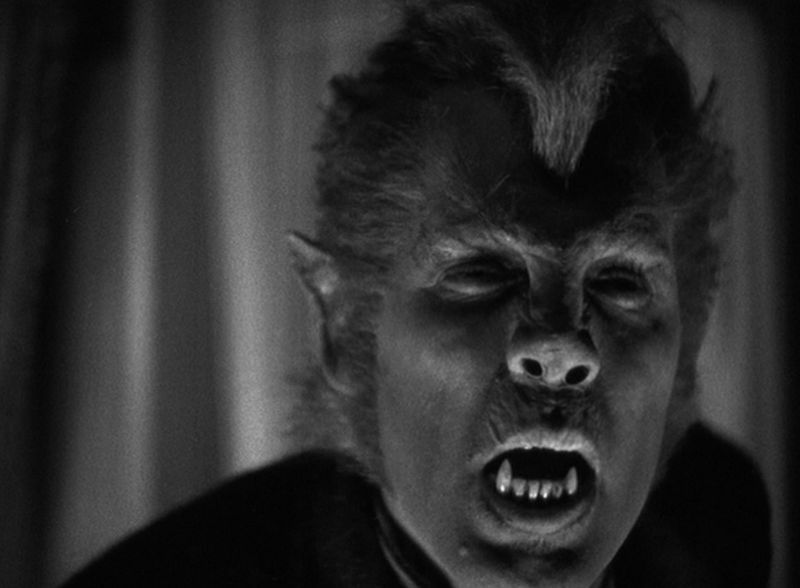 Henry Hull famously refused to wear Jack Pearce’s elaborate makeup design, leaving his werewolf with a relatively human face (Pearce’s wolf makeup was eventually used for 1941’s The Wolf Man). Moreover, Hull’s werewolf is not just a senseless beast. It can think and reason; it can even speak. In fact Werewolf of London plays somewhat like The Strange Case of Dr. Jekyll Mr. Hyde, right down to Dr. Glendon’s decision to rent a room in a London slum. The movie seems to yearn for the kind of literary pedigree that the Stevenson tale enjoyed, and seems to want the audience to view all this silly werewolf business as a metaphor for Glendon's inner demons. 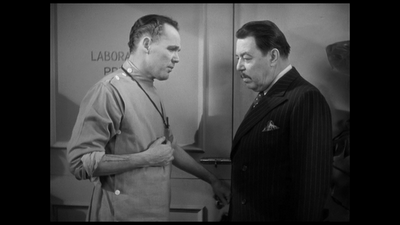 The movie has a hard time taking Dr. Glendon’s affliction seriously, and as a result we can’t take it too seriously either. 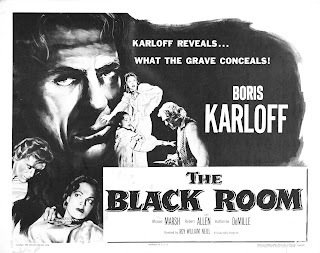 And in spite of The Black Room’s horror-film tropes it gets all literary and showy on us, struggling to look like an Alexander Korda production instead of the low-rent Universal melodrama that it is. Gregor's speech to Mashka about pears (in which he declares that pears are the best fruit because they're delicious and entirely disposable -- an obvious allusion to his opinion of women) might as well have been written for Charles Laughton for his turn in The Private Life of King Henry VIII a couple of years earlier. And the whole look of the movie, dressed as it was in Romantic Revival style, shows its costume drama pretensions all too clearly. 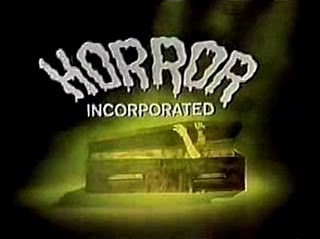 But both movies are largely forgotten today outside of the horror genre, which is just as well. 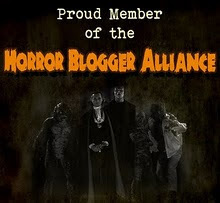 Each of them works best when the horror elements are taken at face value. The Black Room, in particular, works very well indeed. *In an earlier post I misidentifed this location as Bronson Canyon, another well-used exterior locale. Vasquez Rocks was used endlessly in movies and television, becoming so familiar that it was part of a visual joke in Bill and Ted's Bogus Journey (1991). In that movie the lads watch an old episode of Star Trek, in which Captain Kirk fights a lizard-like alien on the escarpment; later, Bill and Ted's evil robot twins kidnap them, take them up the same escarpment, and kill them. All in good fun. WEREWOLF OF LONDON could never hold a candle to THE WOLF MAN, but there simply weren't any screen depictions of lycanthropy before, apart from a few silent films on Indian legends. 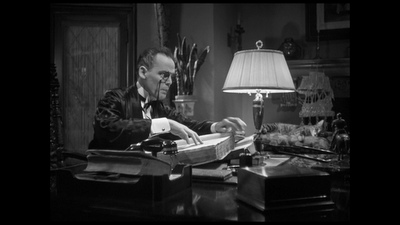 One cannot imagine Lon Chaney putting on a cap and coat before going out on a slaughter spree, but there you are. THE BLACK ROOM holds up superbly on repeat viewings, a testament to the cast and crew, working from a literate, classical script that might very well have been based on actual legend. A special nod to delicate beauty Marian Marsh, the ingenue of 1931's SVENGALI, who previously worked with Boris Karloff in 1931's Best Picture Academy Award nominee FIVE STAR FINAL (she also appeared in Columbia's THE MAN WHO LIVED TWICE, with Ralph Bellamy as an escaped killer who is transformed by a famous surgeon into an upstanding doctor without any recollection of his past misdeeds).